Tourist Information Centre Walk 16 at Fleggburgh to Stokesby01493 846346work Walking RouteThe Fleggburgh to Stokesby Walk is a 7 mile (11 kilometre) circular walk starting at Fleggburgh village hall in Fleggburgh near Great Yarmouth. 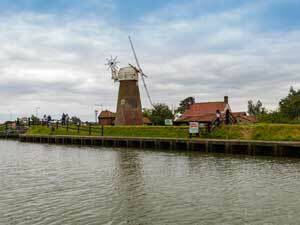 This pleasant walk takes in both countryside and riverside views and passes by windmills and wildlife along the way. Pop into Stokesby village for lunch at the The Ferry Inn situated alongside the river or pop along to the tearooms for a delicious cream tea before continuing your walk. There are no public facilities along this route and limited opportunities for shelter. The Fleggburgh to Stokesby Walk is a 7 mile (11 kilometre) circular walk starting at Fleggburgh village hall in Fleggburgh near Great Yarmouth.